Way back in August I tried some ice dyeing, just for fun. Then I opened my big mouth one day at a meeting, suggesting that as a topic for a Guild Evening Meeting. Little did I know at the time that this would turn into me teaching it! So obviously I had to do a lot more practice. And with all the safety precautions that they require I didn’t want to use chemical dyes at an evening meeting, so I needed to do a bunch of samples with koolaid. Two friends came over one evening and we played around. We tried old Tshirts, wool yarn, wool fabric, and I don’t even remember what else. We learned some stuff, the take away for me being that this was more complex than I’d thought, and if I wanted to teach it, I had to do more experimenting in a structured way. So I bought some small silk scarves from Dharma Trading, some koolaid, and set to work. I was happy with the results. On the left I carefully pleat-folded the scarf, and used orange and lemonade koolaid. In the middle I twisted the scarf and used blue raspberry lemonade and lemonade koolaid. On the right I randomly scrunched the scarf and used the 2 packets of lemonade I had left: blue raspberry and orange. I was sure it would turn out an ugly brown mess, and was shocked that I got some great fall colors. So I got more supplies and in January taught the class to 16 people. Everyone seemed to have a good time, and although only a few of them sent me a photo of their finished scarves, they all turned out well, if not necessarily as planned. 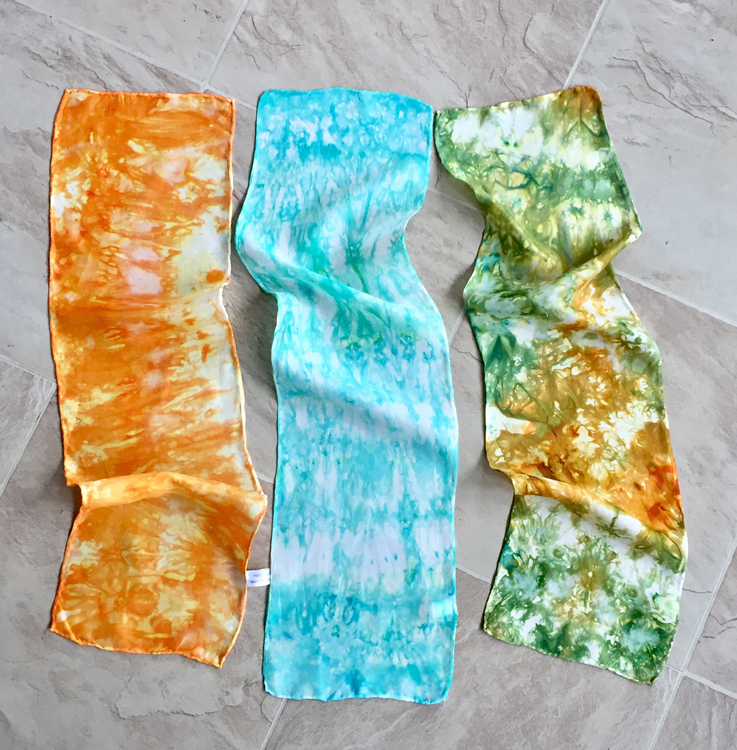 Some months ago, when I bought the onesies and T-shirts for dyeing I also bought myself a pair of mostly cotton leggings. They sat and sat, waiting for me to get to them. Well the polar vortex got me moving! I scoured and then soaked the leggings, gathered some snow, and got the whole shebang set up in my utility tub in the basement. 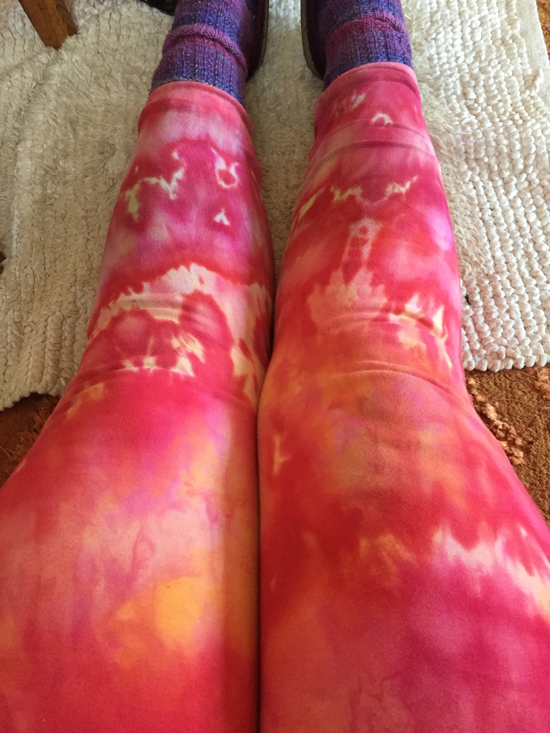 Then I rinsed out the excess dye, washed and dried the leggings. OH NO! I did not want to look like I walked out of a rainbow festival in 1967! When will I learn that less is more when it comes to color?!?! 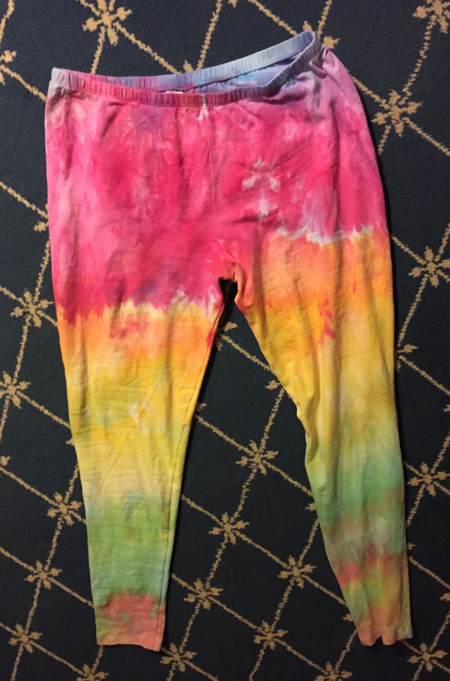 After thinking about it for a day, I decided to overdye the leggings. Sure, I could have done this with immersion dyeing, but why do it the simple way? Do more snow dyeing! So I presoaked again, gathered more snow, and set up shop. Again. I used only red dye, but 3 different shades of red. 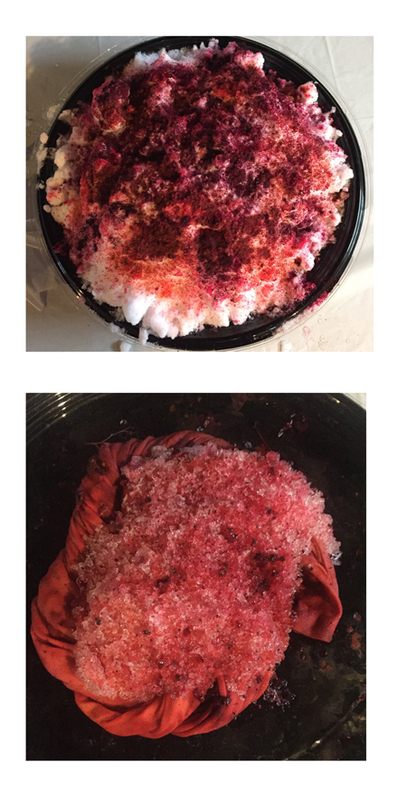 The top picture looks pretty ugly, and I wasn’t at all sure how they’d turn out, but figure I could always immersion dye later if I needed to. Even after a bunch of the snow had melted, in the bottom photo, I wasn’t at all sure that this was a good idea. After batching, rinsing (a LOT, since red dye is notoriously hard to set), washing and drying, I got leggings I really like! I wore them to the gym for my exercise class today and got a compliment. And it wouldn’t have mattered if I didn’t, because I like them. The ice and snow dyeing turned out great. The Koolaid colors turned out good, I never thought of them on the silk scarves, I have dyed roving with them. Leggings are fun before and after over dyeing. Good job with the dying, Peg! Kudos on your experimentation and on learning enough to teach the class Peg… the silk scarves really did turn out quite lovely! Kool-aid… who’d have thought? I’m betting those fun leggings are getting a lot of use! Thanks, Theresa. The winter is leggings weather for me for sure.